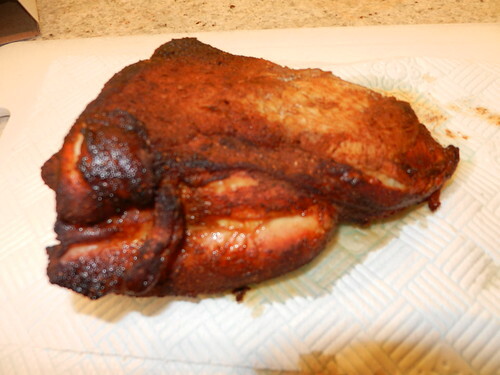 I haven’t done an Alton blog post for a while and this fact, combined with a week off and a MASSIVE desire to smoke my own food brings me to the Good Eats episode “Right on Q” – Alton’s foray into the, often confusing world of Barbeque science and recipes. 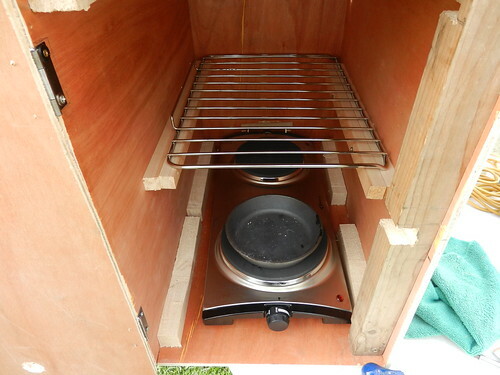 In this episode (check YouTube if you are not in the U S), Alton demonstrates the best way to use a gas or charcoal grill as a smoker but best of al l shows us how to build a proper smoke box using, in his case, a wood reinforced cardboard box, some oven racks and an electric hob. Oft have I watched this episode with the imagined senses of authentic smoky ribs and infused turkey playfully dancing in my head – you seriously have no idea what goes on inside there…. 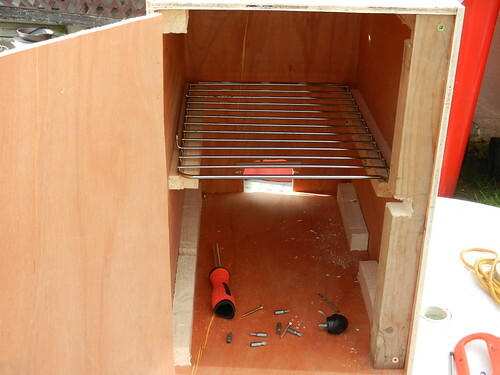 Now there was no particular plan to this project – Carpentry is unfortunately not my forte so the mission was to make a box large enough to hold the electric hob and high enough to ensure the meat is not too close to the heaters to burn. 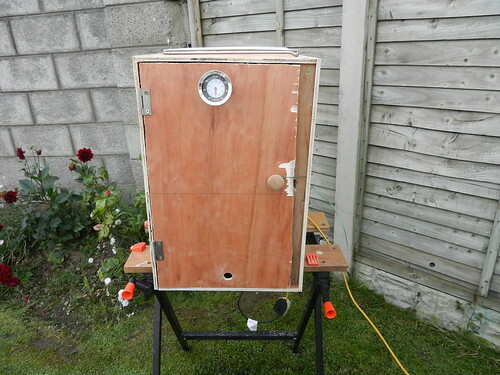 Once the box was completed I drilled a hole in the bottom of the front door and three holes in the top back. These can be blocked off with corks to increase or restrict airflow as required. Onwards then, stout yeoman, to the testing of the Pandora’s Box of smoking magic. First we need to soak about 3 cups of woodchips for at least an hour. Thankfully I had already thought of this and the pecan wood chips were already in the water. 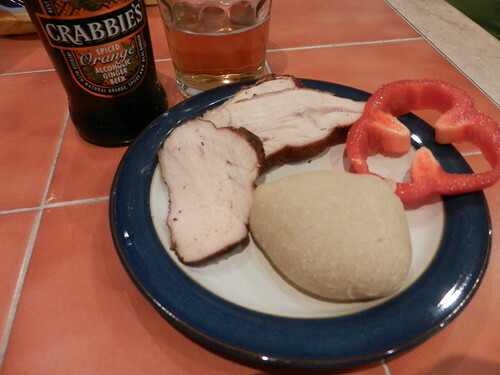 On to the meat – I didn’t have time to get ribs so a quick trip to our local butcher procured a quarter of a Turkey breast. 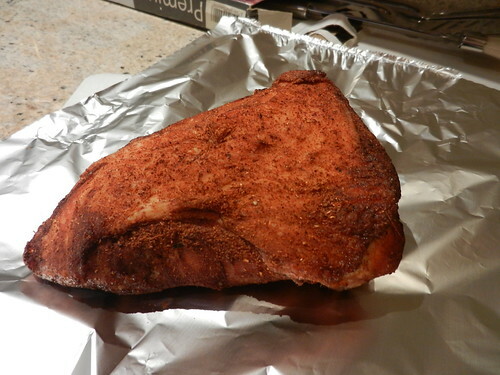 No time for a brine, so a basic rub will do (see Dr. Pepper Pork Chops - I had some left over..). While the Turkey is sitting in the fridge, I cranked up the main burner to full and the secondary burner to the mid-point and set the cast iron dish on the main burner. After five minutes or so, I added the woodchips to the pan and placed the turkey on the rack with the meat thermometer inserted into the thickest part of the meat. The woodchips need to be changed about once an hour.